When I was a kid, we played a lot of baseball. Organized and unorganized. Spring, summer, fall, and winter. Morning, noon, and night. The first organized league I joined was at the local park. It was called the Ice Cream League and my team was the Chocolates. Hey, don't blame me. I didn't make up the name of the league or my team. But, I'll tell you one thing, we sure beat up on those Vanillas and Strawberrys. After park league, I graduated to Little League. I was one of the few kids who was drafted into the majors as a nine-year-old (bottom row, left). Wink, wink. Our manager -- Mr. Martinez (yes, he'll always be Mister to me) -- had the exclusive rights to me because my older brother Tom (the lefty in the back row) was on the team. Mr. Martinez took me and I played for him all four years. The name of our team was the Yankees. You know, the Yankees with the green letters, hats, piping on the sides of our pants, and stirrups. We didn't have George Steinbrenner's money behind us so we had to wear big patches on the back of our flannel jerseys with the name of our sponsor. One year it was a local laundromat, another year it was Sparrow Realty. Man, I had so many patches on my jersey, it felt like I was carrying five more pounds than necessary. I was always a big kid for my age so I didn't need any extra weight to lug around. Heck, I was so slow, my high school coach used to give me a hard time by timing me with a calendar when I ran from home to first. I can hear him now, "April, May, June..." Cruel. But one helluva coach. In between Little League and high school, I played two years of Pony League and two more years of Colt League. I also played Connie Mack and American Legion in the summers during high school plus a couple of years in what was called a scout's league during the winter. Although I played at least ten years of organized ball, some of my favorite memories involve pickup games with my brothers and the kids from the neighborhood. Gosh, I even enjoyed playing baseball by myself. I would throw the ball as a pitcher against our brick planter, then turn into a fielder when the ball bounced back to me. On occasion, I would lob the ball onto our sloped roof and play outfielder. When I wasn't just chillin' in the backyard (resting on my catcher's mitt), I was either recreating a Dodgers game I had just attended or perhaps making up my own game while listening to Vin Scully on the radio. Give me a rubber ball (note the condition of the one next to me in the photo) or a tennis ball. They both did the job. Hardballs were generally limited to the times we played catch because we didn't want to rough 'em up. Besides, real baseballs just didn't do the trick when it came to throwing against a planter or a wall or off a rooftop. We played all sorts of games from the more conventional over-the-line (also known as "hot box"), home-run derby or pickle to what we called first and short(stop), pitcher and catcher or swing the bats. The latter was something I made up as a youngster. It would almost always be played on a Sunday in the early evening, immediately upon returning from an afternoon game at Dodger Stadium. I would keep score of the game, then play it once again all by myself in the backyard. It was called "Swing the Bats" because I would mimic Maury Wills, Jim Gilliam, Willie Davis, and the opposition by swinging the bat (from the left or right side, exactly like each hitter) at an imaginary pitch and running the bases accordingly. I had an aunt who would watch me through the kitchen window. To this day, she teases me for staging the commercials ("Blatz is Milwaukee's finest beer!") and stopping action for the proverbial station identification. I even went so far as to provide cheers and boos from the crowd, always whistling when the Dodgers scored a run or won a game. Call me nuts -- I'm sure Aunt Kathy had her doubts -- but these ball games meant the world to me back then. As I got older, Swing the Bats turned into wiffle ball and games using ping pong balls and the orange 76 Union balls (that were meant to be placed atop the radio antennas on cars for identification purposes) as the baseballs of choice. We also brought out our Larry Sherry Pitchback, a large, rectangular frame attached to elastic netting that allowed you to play catch with yourself, when it wasn't broken, and we occasionally played Sacket, a one-on-one baseball game, at the local park. Depending on the type of game, we used wood or plastic bats. I was particularly fond of a game-used Lou Brock bat that was given to me by the Cardinals batboy one afternoon. It was broken but I made it work by driving a few nails into the pine-tar-covered handle. The bat must have weighed 34 ounces (or about two to four more than I could realistically handle in my pre-teen days) and, of course, the wood bat was not ideal for hitting wiffle, ping pong, and styrofoam type balls. But that didn't matter much to me because I was swinging the real deal. If we weren't playing ball at home, we walked or rode our bikes (with gloves hanging on the handle bars) to the nearest park or school. Some of our best over-the-line and home-run derby games were played on a grassy area at a community college. I think what strikes me most when looking back is the fact that we put these games together without the involvement of any coaches, umpires, or parents. What a concept! Let me tell ya, dem were the days. most excellent. you were even a ham back then. Thank you for reuniting me with memories of my youth. I remember playing solitaire games in the backyard where I would pitch against the garage door. The tennis ball hitting the doorhandle would symbolize a hit ball with its erratic directions as a result, the open Street and Smith sitting on the doorstep for easy reference to see who I would be facing next, recreating the play by play of Herb Carneal, Dave Van Horne or Curt Gowdy and out of town results based on the flip of a coin (heads for the home team and tails for the visitor). What I wouldn't trade to return to those days? Back in the day, when I was a kid, we used to play stickball. Not the stickball game that you always see in those Willie Mays film clips from the '50's. (Teams playing each other, with bases in the street.) We played one-on-one, where a wall was your backstop and the pitcher threw to a box on the wall for a strikezone. You hit it - if he (the pitcher) fielded it, you were out - if not, it was a hit (and the distance determined the type of hit). But, we also played a "short court" version of this game - called "Yankee Doodle." In this game, the batter FACED the wall (standing about 10 feet back from it) and the pitcher stood (about 20 feet) BEHIND the batter. The pitcher would throw the ball (from behind the batter) against the wall. The batter would then have to hit the "pitch" as it bounced off the wall - back towards the wall. And, then, the pitcher would have to field the batted ball as it bounced off the wall. Same rules - catch was an out, miss was a hit (of some kind). We also had a game called "Ace, King, Queen" where we would line up side-by-side, shoulder to shoulder, usually 4 or more, facing a wall (about 8 feet away). The guy on the far left would start off by throwing the ball against the wall. If it came to you, on the bounce or fly, you had to catch it cleanly. If you did, then you got to throw it against the wall. Miss it, and you had to move all the way to the right (end) in the row. Best and hottest catcher was always to the far left (hence he was the Ace). Last guy with a miss was always at the end - as the Queen, Jack, or 10, I guess. Makes me wish I was 10 again, playing Ace, King, Queen. Thanks, Alex. Good stuff, Dan and Steve. Did you guys play over-the-line or hot box, home-run derby, or pickle when you were growing up? Great post, Rich. I could write a book on this stuff like this that I would do at home or in the yard. I was often staging games in the yard, usually pitching a tennis ball up in the air and swinging with a kids' wooden bat. I was really small as a kid, and the challenge was to hit it well but not to hit it into the swimming pool (no, I didn't know how good I had it back then) that was beyond the yard's center field. One time, when I tried turning around so that the pool was behind me, I ended up breaking a window. It was sad when I grew up enough that the yard could no longer contain me. I would also play entire games in my bedroom by bouncing a ball off the wall and seeing what plays I could make. I would purposely go for difficult ricochets, thanks to one wall that jutted out at the top (the bed was underneath). And yes, I would keep score of these games. By the way, everywhere I've gone, the same game that I and all West Coasters called "pickle," has been called "hot box" or "running bases" in the Midwest and East. You run into this phenomenon? Pickle is the best name for it. There was one summer when a group of us were about 14 that we played wiffle ball absolutely every day. We played on a grass island defined by three intersecting streets. The dimensions were perfect for wiffle ball -- 150 feet from home to the street in right, a little longer in left. It's amazing nobody got killed. We established a rule that you had to have at least one foot on the grass to rob somebody of a homer. So if somebody hit a liner to right (that was 52nd Street, a pretty busy one) you had to take a quick look at traffic, get to the curb and get ready for whatever meeting of ball, hand and car that might take place. Some screeching near misses, but no direct hits. We kept stats so there was an incentive to be there every day. This kid named Brad, a slight righthanded hitter, hit 98 homers because he perfected an inside out swing that took everything to the short figurative porch in right. We had a rough agreement about pitch speed -- you could do anything you wanted to make the ball move, but you couldn't throw more than about half speed. Sometimes when one team would get behind the pitcher would start to bring it a little harder, which would cause some disagreement, but in general the games proceeded without two much disagreement. We decided to have a seven game World Series the week just before school started. We divided into teams of six, had some pomp and circumstance, and played an incredible series. My team went up three games to nothing, but the other team rallied and won the next three games. What happened was one of my teammate's younger brother, who turned out to be a fantastic ballplayer -- captain of the All State high school baseball team -- suddenly matured as a wiffle ball player and dominated the game. In the seventh game with the score tied, there was a close play and a huge argument ensued. I don't remember the details, but everybody quit and the series was never completed. And that was it for the wiffle ball game on the island. The next year we all had jobs or were learning to drive or had girlfriends, and although we played from time to time the games never achieved the passion of the games from that summer. When we get together now -- 30 years later -- we talk about that World Series and speculate not only about who would have won, but how fitting it was that we left it hanging. We've all got a claim on Series glory. Based on the look of thos uni's and the hair-lengths, gloves, shoes, etc., & matching 'em up with pictures from my youth baseball, I'm gonna guess you're around 45 or 46 years old. Those coaches have a classic late-1960s coach look. Great reads, Jon and Katman. Thanks for sharing. Were my Jack Purcell's canvas shoes a tip off? Did you guys ever play either 500 in the street? I remember a "knock-em up and lay-em down", which may have been a version of the same game. The hitter would toss the ball and hit it to a couple fielders down the street. A fly caught was worth 100, a one hop line drive maybe 50, ground ball 25, and as a fielder you couldn't go over 500 or you had to re-add. On the throw back to the hitter, the hitter would put the bat on the ground, and the fielder would try to return throw the ball with enough accuracy and juice on it to, hopefully hit the bat and cause the hitter to not cleanly field the ball after it hit and jumped over the bat. A successful throw from the fielder would allow him then be the hitter (without having to accumulate 500 points). Sound familiar? To the question: "Did you guys play over-the-line or hot box, home-run derby, or pickle when you were growing up?" We used to play a game on the sidewalk - where you each stood in a square of the walk and had to box/punch the ball over the line to the guy in the next box. Is that what you mean? Homerun Derby, we had a version of it. At the local HS field - where RF was also half of the football field. A batter would stand at 2B and hit the ball out of hand. If it went into the football bleachers, it was a HR. All other balls were in play, etc. It was a 2-man game. Pickle? We used to play what we called "running bases" - I'm pretty sure that was the same thing. Wow. Talk about bringing back the memories. Since I grew up in the same area as you, we played the same games (my uniform was just the same, execept we weren't the Yankees-we were Walker and Lee Realty). One guy down the steet would toss hair curlers (the pink plastic ones) and hit them with his wiffle bat. I am sure his sister was glad about that. And yes, you were a ham back then too. It's posts like this that remind me what I think a great blogger should be. That is, someone with more than one ability. A well-rounded player, so to speak. The fact that you are able to do historical analysis, and then contemporary analysis and then add personal articles like this, give you a depth that many of us lack. Not only that, but sharing parts of your history--which is obviously soaked in baseball, both professionally and privately--remind me a) why I'm a baseball fan, and b) why you are one of the greatest guys I've met through writing about the game. Both photographs are great, but I especially like the one with you laying on the grass, under the shade of a tree, resting your head on a mitt. I wondered if you were caught yawning or if you were just aware that your picture was being taken. 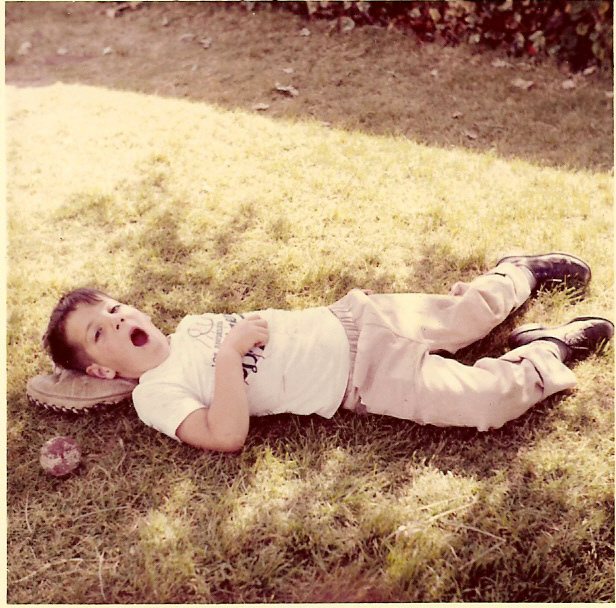 I like to image that you were yawning, taking a nap in the backyard late in the afternoon. Just the way your body is sprawled suggests a kind of boyhood innocence. Not a care in the world but baseball. I remember those green Yankee unis well. John Wyman, who woulda-coulda-shoulda been the Pepperdine version of Lenny Dykstra before tearing his rotator cuff, used to tower in those duds back when my brother Larry played with your brother Gary. Then either the team or the green got euthanized by the time I showed up. Craig - Yes, we also played 500. We generally played that game right out in the middle of the street just like you said. The rules you mentioned are spot-on. Great memories. Steve - In our version of over-the-line, we normally had two or three players per team with one or two in the "hot box" and the other in the outfield. Only left of center field was open. You would pitch underhanded to your own team. Pitchers would stand on the third base line to toss balls to lefties. If you hit a groundball and it was fielded cleanly, it was an out. However, if the first bounce was in the "hot box" (a rectangular area generally between the second and third base lines extending 20 or 30 feet toward the outfield), then that was a single even if the ball was fielded cleanly. Fly outs were fly outs and any ball hit in the air beyond the farthest OF was considered a home run. Alex - I think I was caught yawning in between one of the games in a tripleheader or something like that. Thanks for the kind words. Much appreciated. Craig, Big E, and I played fast pitch softball on the same team after we got out of high school and college. Talk about fun? That's another article waiting to be written. Matt grew up down the street from me and played the same games. Only the participants were different due to a gap in our ages. Matt and I have become reacquainted via the Internet after a few decades owing to none other than the game of baseball. Pure poetry. DID you play GROWING UP? Rich: Joe, Kory, John and I still do it. We slap on the Ben Gay and put on various joint braces, but we do our thing: each taking turns doing a little BP and fielding balls at are old Junior High School. Also, Summer doesn't really start until we've logged in a couple hours of wiffle ball. Why does this have to end with adolescence? I'm surpised that, as far as I can tell, no one has mentioned "3 flies up" or "Workup" as their games of choice. 3 flies was a simpler version of the 500 game Craig and Rich are remembering. Usually in the middle of the street, the batter would hit balls fungo style to the other players. The first to catch three fly balls was the next batter. Problem was when the little kids like Richard got to bat, they couldn't muster enough bat skill, especially bat speed, to hit fly balls, so they stayed up all day while we shagged their grounders. That's why 500 became the game of choice -- eventually, someone could catch enough of Richard's grounders to earn 500 points and the reward of hitting. Workup was played when a few more guys (ions before Title IX) were available. But my fuzzy memory tells me it was more of a game used by coaches at organized practices. A full field or near-full field game played with three or four batters with everyone else in the field. You stayed on the hitting team until you were put out. Once out, you were relegated to right field or the equivalent depending on how many were playing. The pitcher went to the hitting team and everyone moved up one position in the pecking order. My favorite was the game on the lawn at the community college � two against two or three against three. The two-story classroom building in left field served as a kind of opposite field Camden Yards type backdrop. We used a tennis ball and wood bat. The distance to the building was perfect for demanding well hit balls and creating exciting plays at the wall (behind the low shrubs). My favorite at home game was Gnip Gnop � ping pong ball for a baseball and wiffle bats in the backyard. The dimensions of the yard (in suburban L.A. our typical lot was 50 feet wide, playing alongside the garage left us about 35 feet to the next property) were again perfect for demanding solid hits for home runs onto the roof of the garage next door or into the corners of a maze of fences, trellises and bushes. The great stuff you could throw with a ping pong ball was awe inspiring and a perfect challenge for the hitter. Don�t let Rich tell you that he could hit his big, left handed brother. Only in his fantasy games. Great story Rich! When we were kids we played a two person game that consisted of a sock stuffed with one page of newspaper,wound tightly and then wrapped into itself (this was the ball) and a broom stick (the bat). We played it between two homes and how good a hit you had depended on where you hit the opposing house (on the roof was a home run). If you didn't hit the house it was out. We did this all summer, had standings, kept statistics (great way to learn math) and in general spent the rainy summer days in up-state NY occupied in this manner. As you say, dem were the days! Man, reading this stuff is nostalgic. Three Flies Up and Work Up? How could I forget? Wow, we kids sure knew a bunch of games. I guess which one to play was based on a combination of the number of kids and the venue more than anything else but, boy, we sure had a vast menu of games. Pickle or running the bases as it was also called was the game of choice on lawns; wiffle ball and the like were best played on driveways, patios, etc. ; three flies up and 500 were the best street games; over-the-line, home-run derby, and pickup games were saved for the larger, grassy areas at parks and schools. And those dice games made for the best indoor games. Tom and I grew up playing APBA, which was a more advanced version of the one Bill recalled. Prior to APBA, we played All-Star baseball. Remember that one? You fit customized player cards onto a spinner. The number "1" was a home run. Liners could invoke good rhubarbs between the two participants. If you played by yourself, it gave you a bit of leeway depending on whether you liked or disliked the player. Do I have any doubts? You're still nuts! An article like that one brings back great memories. In High School my friends and I used to play over the line and when it got dark we didn?t stop we just drove down to Katella Ave. and found the Mitsubishi office building, which was later referred to as "The Mitch" and always had lights on in the parking lot. Great article Richard. Couldn't resist telling this one on Richard. Years ago Richard and his older brother, Tom would amuse the family when Tom would hold up a baseball card and Richard would identify the player and then spit out all the stats on the back of the card. They did this over and over with card after card until we made them stop! The interesting point of this story is that Richard was only four and couldn't read. Tom had coached him. So Richard's facination with statistics goes way, way back! I played all those games with Rich and his big brother Tom, including my own APBA set. tom trade me my first baseball card. The lederers are easily identifyable in the pic and even the martinez kid, steve, but the rest are vague memories, despite playing in the same little league against them on the Giants. Nobody was allow to be the Dodgers as then everyone would want to be them. My favorite was also at the community college in lakewood village, just a few minutes away by stingray bicycle. Each area had different rules and equipment. the long field along arbor was for hardball and the two on two against the building was only for tennis ball, so windows didn't break. The bushes at the fence (the building two stories high)were three foot jade plants that grew very large in the SOCAL climate and we were always breaking pieces off when we climbed back for a long line drive. With all the summer school classes and wear & tear on the lawn & bushes, it's amazing we never were run off. Later when I took college course there during high school, the tennis ball field was the computer science building and the hard ball field became a parking lot. I also remember breaking the Lederer kitchen window with rubber ball in some style backyard game. Later they remodeled the house and there was no "stadium" room left. I have tried to tell people about the game of sacket over the years and they look at me funny....I played sacket at Fletcher elementary school in the city of Orange, CA. Back in 1972 I was hit in the back of the head with a sacket bat....blacked out for a few seconds....later needed stitches....my best friend felt so bad! Now I can show my friends...and children this site and verify that there really was a ball game called sacket!